The Spotted Tongue: 100 things #8: Dahlia goes fishing! I arrived home tonight from our Irish traditional session with food in hand for Dahlia, as I usually do. I've been trying to get her to catch food. Usually when you toss food at her she simply flinches and let's it fall to the ground. So I've been dropping it from just above her mouth to get her to realize she can catch it. Well, she has TERRIBLE eye/mouth coordination. 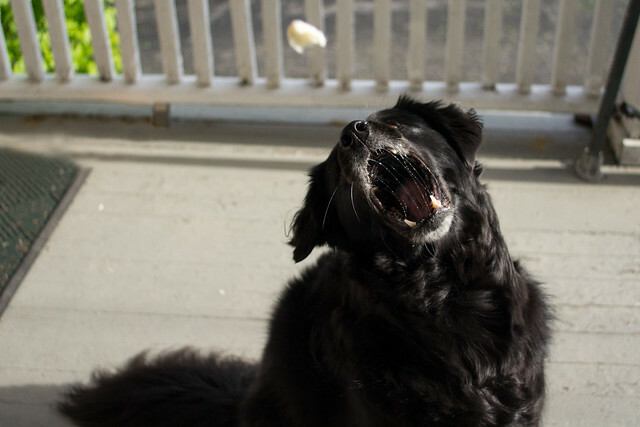 Her method now is to just open and close her mouth rapidly in the hopes of catching it. Most of the time she misses. Sometimes she's lucky enough to get it. Tonight I decided it would be fun to take the camera out and take photos of her attempts.